You don’t have to wait until next summer to experience all the fun of camp! 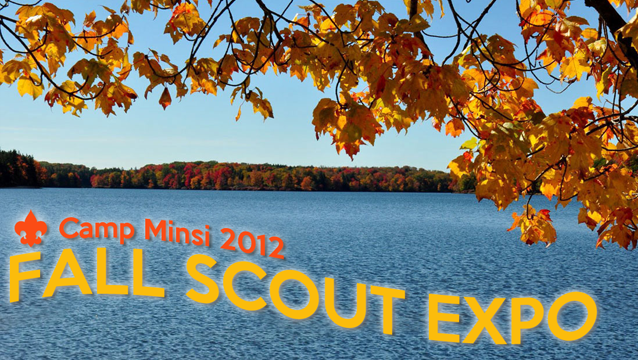 Come to Camp Minsi on October 13, 2012 for Camp Minsi's Fall Scout Expo. Scouts of all ages are invited to Camp Minsi for a fun-filled day of Scouting events in beautiful outdoors of the Pocono mountains. Cub Scout dens, Boy Scout troops, Venturing crews, and families can come to camp for Camp Minsi’s first annual fall open house and open program day. Hone your skills at the shooting ranges, use a two-man saw, throw a tomahawk, enjoy a guided nature hike, taste some fresh Dutch oven cooking, stamp leather crafts, go fishing in Stillwater Lake, and much more! The Camp Minsi summer camp staff will be on hand to run a variety of open programs and special events for Scouts – including ScoutCraft programs and shooting range events. Plus there will be lots of special presentations and demos (to be announced) throughout the day as well. You don’t just have to come for the day; your unit can make a weekend out of the event! Camping opportunities are available. Reserve a campsite and enjoy a whole weekend of fall Camp Minsi fun.